The Dalton Police Department is celebrating its second-ever win in the Governor’s Challenge. The annual competition sponsored by the Governor’s Office of Highway Safety (GOHS) honors outstanding achievement in traffic safety education and enforcement. Dalton’s win comes in Category 4 which includes municipal police departments with between 51 and 100 sworn officers. Competing agencies are judged each year for enforcement programs, educational initiatives, and public information efforts in three categories: occupant safety, speed enforcement, and DUI detection/prevention. In the past year, Dalton’s Traffic Enforcement Unit (TEU) has engaged in several education campaigns in Dalton’s schools to inform students about distracted driving and driving under the influence. The TEU took part in the Teen Maze event that educates young drivers about the impact of dangerous driving behaviors and choices like drinking and driving. While the TEU is focused on traffic issues, the efforts of the department’s patrol division as a whole contributed to the different education and enforcement initiatives and their efforts are recognized by this award. The GOHS also considers the work that police agencies do with their local public works departments to try to improve roads or intersections that are especially prone to crashes. This was the Dalton Police Department’s 18th year taking part in the Governor’s Challenge. Dalton has multiple second and third-place finishes in the past, and last won top honors in 2013-14. The Peachtree City Police Department finished second, and the Rome Police Department finished third in Dalton’s category. 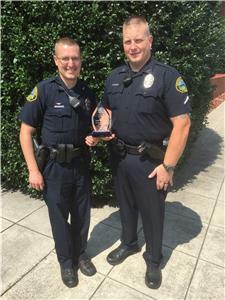 In addition to the overall award, Officer David Saylors was honored individually as the Traffic Enforcement Network Coordinator of the Year for the north Georgia area.